My kettle boiled dry and a bunch of stuff came out of the inside. Is it ruined? Unless it is leaking, your kettle probably isn’t ruined. Because the bottom is solid copper, it tends to oxidize from exposure to the air, which will carry a blue tint. Also, as most municipal water has some level of hardness, this builds up on the bottom (mostly) of the kettle. What likely happened is that the boiling dry precipitated some of these deposits to flake off which is what is coming out. It is a good idea to periodically add some pure vinegar to your kettle, boil it, and let it stand. Then pour it out and rinse thoroughly. That water that comes out should have lots of hard water chunks and will be very blue. This cleans off the deposits. 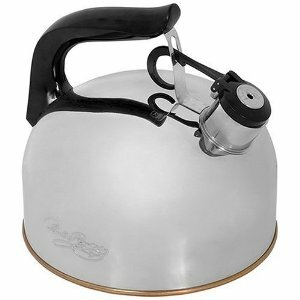 For more about Revere tea kettles, see our information page. We sell replacement caps and triggers, and handles, for the 2 1/3 quart kettles. The economics of small business: why does that part cost so much?